Some users who are trying to install OS X Yosemite 10.10.4 or iTunes 12.2 have discovered the Mac App Store will freeze, with an endless spinning wait cursor and the updates never showing up. Investigating further reveals that a process called ‘softwareupdated’ simultaneously goes haywire and consumes 99% CPU for an indeterminate amount of time if left unattended. If you encounter either of these issues when trying to install the aforementioned updates, there are several possible resolutions to this, but you’ll have to temporarily circumvent the App Store in either case. After encountering this issue myself while attempting to update one Mac, I was able to resolve it by manually installing iTunes from the command line software update mechanism, which avoids the App Store. Once iTunes 12.2 installs and is no longer available as an update, everything else worked fine in the App Store as usual in my case. For some users, the problem has persisted with the actual OS X 10.10.4 update as well. For installing OS X 10.10.4, you can either attempt to update from the command line, or download and use the Combo Updater. Either way you’ll want to back up the Mac beforehand, like you would with any other system update. A restart is required to complete the installation. Getting software updates from the command line results in the same versions as downloading from the Mac App Store, it just avoids the application itself which is hanging for whatever reason. Most users should not encounter this problem, but if you do, let us know in the comments if these solutions work for you. Apple Discussion boards are full of complaints and problems with OS X 10.10.4, everything from crashing App Store to crashing Mail, to Mail no longer working with Gmail, to Wi-Fi dropping, to slow wireless networking, to crashing apps, to slow behavior. Apple even had a Public Beta with 10.10.4, what’s the deal?? My MacBook Pro is working nicely since the update. There will always be some people that have issues with OS updates, they are very complex. Which are you saying are very complex? People who have issues with OS updates, or OS updates? If the former, no wonder I am in trouble. No idea what the problem is. I tested each build of 10.10.4 before the public release (we are talking about over a month) and never had the problems people have been complaining about. the first builds had some Finder issues, but other than that each build of 10.10.4 has been stable and noticeablely better than earlier releases. Still no problems with the public release either. Sometimes I wonder if people have trouble because they have years of backdated files floating around in their systems, or never reformat drives by writing zeros to map out bad sectors before doing a reinstall of your OS. The MacBook Pro I have which encountered this issue is a mid-2015 model, about 2 months old, shipped with OS X 10.10.2 preinstalled, and there is very little third party software on it. So no, the problems are not limited to users with old files and crud floating around, this is a brand new Mac, hanging on an App Store update. I have bening beta testing 10.4 also on my iMac no issues but I wiped clean my macbook air and reinstalled 10.3 to take on a trip. I could not upgrade it to 10.4 from the app store. had to go to apple downloads to upgrade. I had all the fan issues as well. very peculiar. I guess I will not update for now, I don’t see anything worthwhile in the update anyway. This worked for me, too. “Finding available software” and nothing else. Cant update the OS or the iTunes. Both gets me stuck. I managed to do it by manually downloading it from Apple’s website and installing it. I had to reboot to be able to install it (don’t know why) and, after that, the update mark was still on on the Mac Store icon. I opened it and let it spin for quite sometime until, eventually, it understood that i’ve already updated. Same for me, I’m stuck waiting for available software to show. I had updated to 10.10.3 on month ago when I tried to update Xcode to 6.4 ; it’s a mess since. Worked for me too, THANKS smh. MacBook Pro was almost stationery this morning. Same goes to me. Download combo manually from website. Nope.. I didn’t have it installed..
It’s funny.. I have never been able to get a new version of iTunes through the Mac app store on my Macbook Air.. I always have to get it manually. I had the same problems, process softwareupdated taking max CPU, running beachball when trying to update using App Store. Solution for me (MacBookAir 13″ mid 2012) was to kill that f#cking proces and restart App Store to get the Yosemite 10.10.4 update. Once downloaded and installed Software Update kept running as advertised, no problem getting iTunes 12.2 or any other update. I tried all most of the other solutions, and yours was the only one that worked and it is the easiest. Endless checking for updates in App Store, Handing 99.9% SoftwareUpdate process, endless restarts to eliminate all solved with this. Earlier 10.10.4 installation had failed as not enough disk space. Perhaps it is this event which corrupts the prefs file(s)? This is the only solution that worked for me too. Thanks! I tried some of the suggested solutions but clearing the /Library/Updates folder saved my day! seems that did the trick for me too, thanks. OH WOW THANK YOU SO MUCH!!!! I’ve tried absolutely everything and nothing worked even slightly. I couldn’t even get to install anything via the softwareupdate -i -a command. But this worked!!!! You literally just saved my day. Thanks a bunch. showupdates didn’t show the Xcode 6.4 update, but once all else was updated from the terminal, AppStore was able to update that. I had the same problem here, thought was because my isp or some firewall on my macbook. The solution for me was logging off from Mac App store, restart and reset pram, download both itunes and osx10.10.4 update from apples website. But i still have a problem with other updates. Pro Video Formats Ver: 2.0.1 keeps showing from time to time as a needed update, and I have already dowloaded it from apples website too. Anyone with a solution? Had the problem and did a safe boot which allowed me to access the app store. All seems good now. Had problem with one of four machines. softwareupdate -i -a solved the problem. Anytime this happens I just run CCleaner to remove temp files and misc. caches followed by repair disk permissions & restart. I did the same (with another cleaning software) and did a repair disc permissions. It resolved the issue. I also ran a cleaning software which also repaired disc permissions and that resolved the issue. I tried running Onyx to do some cleanup but the only thing that worked was doing the iTunes update from the terminal. I had the same problem on a 2011 MacBook air running 10.10.3 Software update would not refresh and the fans were on constantly. I used activity monitor to check CPU usage and software update was not even running. I tried the terminal procedures and none of them worked. So i went directly to Apple’s website and downloaded the basic 10.10.4 update since i was running 10.10.3 the updated installed fine but fans still ran at high speed, then I went to software updates and ran the new iTunes update. Installed and ran fine. fans still on hight I went to activity monitor and saw something to do with software updates using 28% of the cpu. Killed the process and fans finally stopped running. Not sure why that was still running after both updates were applied. I found that going into Safe mode and then doing update resolved the problem. Only had problem on 1 of 3 Macs. RE Mail not working with gmail, I had to re-enable the “automatically update settings” in imap and smtp preferences — once that was done, Mail started working immediately. I was having this problem on my wife’s MacBook Pro from mid-2012 running 10.10.3. I ran ‘sudo softwareupdate -i iTunesXPatch-12.2’ after doing ‘sudo kill -9 220’ [process id for softwareupdated]. [Old unix habits] After this, the App Store worked just fine. Thank you. I saw the looking for updates hang on the App Store, so I downloaded the 10.10.4 update from the Apple Support downloads page. Running the update produced the softwareupdated problem. – softwareupdated was showing 40GB of memory used, and 65K ports! Anyway, I shutdown everything and restarted the system, and the install ran normally. App Store worked with no problems after the update. I noticed the same thing with softwareupdated taking up 30GB of RAM, LOL. Something very broken. Apple, come on, this is our productive OS X! iOS is for kids, OS X is for adults, lets get this thing working. Thanks! I have this problem and yours solutions help me! I tried the given solution but it did not worked. The terminal was did not showed anyting after Finding available software. I think the software update was downloaded but did not install as many times the popup for restart was coming on my screen but when I clicked restart it did not did so. thanks! your solution works for me, but after rebooting my mac. The day you face God, He judges you by His law (no lying, no hating, no using His name in vain, no lusting in your heart, etc); you’d be guilty. The sentence: a timeless lake of fire made for Satan and his angels. If you want eternal life accept the legal transaction Jesus Christ did for you on the cross over 2,000 yrs ago (deny yourself, carry your cross, follow Him) so your case can be legally dismissed and you’ll be granted eternal life with Him (no more sorrow, no more death, no more crying). Eternity is timeless; I wouldn’t want you to wake up in hell (if you wouldn’t sell your eyes bc you love them, how much more should you care about your eternal soul). 151,600 die each day. GBY! Must be one of those fanboi’s. So uh, how about those Macs eh? Well, uh, how’d that OS X update work out for you then? Sounds like Apple has serious quality control problems with their software. You haven’t ever used Windows I assume. I just buy a new Mac Pro every time an update comes out. Much easier to have the brainiacs set it all up for me and deliver it, then I throw away my old system. Try it, it might save you a lot of hair. I had this problem on two Macs. Repeatedly force-quitting softwareupdated eventually allowed the update to complete. Booting in Safe Mode allowed me to install all software updates after the store froze up with a grey screen. After rebooting as usual, the app store worked as expected. Ran into this on a MacBook Pro. Worked perfect as described. Thanks. It seems that mostly MBP’s seem to be affected. I also had this issue and downloaded the combo update and that ended up working. i can install it again and after installation they are still there.. I tried the command lines in Terminal but it’s stuck finding updates on there too. You can also use ActMonitor to renice the offending process(es). Once you’ve set the right priority and clicked on “Set and remember”, your process won’t gobble up so many CPU cycles. I have the same issue with my 2015 MBP. App Store updates we a no go for 10.10.4, iTunes, and Garageband. My 2011 MBP didn’t have any problems with App Store updates. 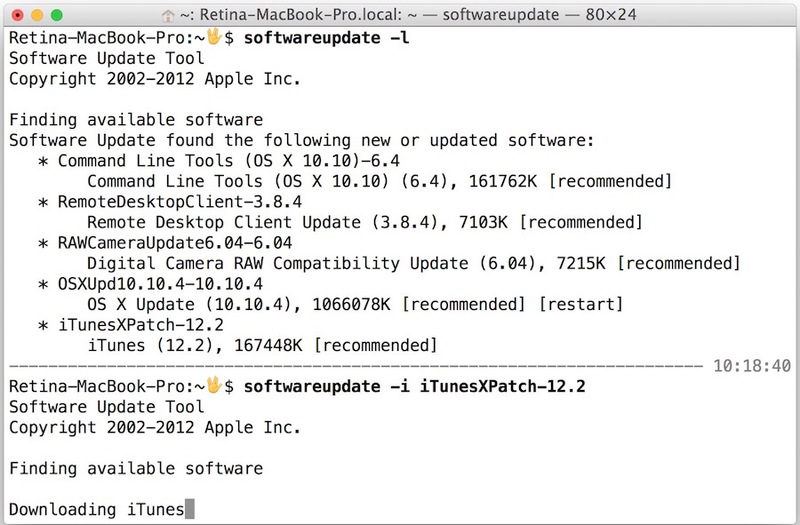 Doing updates by the command line, I did notice that none of the updates show up as installed through the App Store. Went ahead with the update. Completed the update and then when my Mac went to restart my Mac shut down but never started back again. Tried every possible thing from resetting the Smc/nvram but nothing. Till now. Don’t know what to do. I would restore from a backup and avoid OS X 10.10.4 it’s proving to be more problematic than it’s worth. How Apple continuously releases these mucked up OS X builds amazes me. This thing went through a public beta, it’s supposed to fix bugs not create new ones! I had to restart my Mac to get it to work from the terminal because the App Store was doing way too much without the processes showing, but it worked fine other than that. I can finally update Xcode that came out as well. Is there an issue with not updating 10.10.4 until Apple fixes the software update (and, from the sounds of it, the software itself) in, presumably, the next couple of weeks? The “softwareupdated” trashed its cache data. Probably it got confused by the App Store problems. For some reason it can not recover from this situation (see strange error messages in the “/var/log/install.log” file. “/var/folders/zz”. Do a “ls -l” and locate the sub folder owned by “_softwareupdate” and delete this on. After a reboot everything should work again (until the next time it trashes its data when the App Store is down ;) ). 1) Moving the whole “zz” folder is a bit more crude, but does no harm. It only contains various temporary data by various system processes and can be safely deleted. Worked exactly as advertised. After installing iTunes with the command line utility the App Store worked again and I was able to install all other updates. Thanks! I had same exact issue. Downloading the combo manually from website resolved the problem. Pretty spectacular foul-up judging by the large numbers of people affected. Your solution worked for me. I had the “checking for updates” circling arrow after initiating the iTunes 12.2 update. Folks, I immediately had issues when I updated to iTunes12.2. I could not QUIT iTunes. I always had to Force Quit. Both my iPhone4 and iPad Air became unrecognized by iTunes12.2. Some of my iMac stored movies were missing and moved around. So I rebooted and reinstalled OSX10.10.4 which included iTunes12.2. Rebooted repaired disk and repaired permissions. iTunes12.2 has same issues. Called Apple Support. After about a half hour, we determined that my iPhone4 needed to be rebooted. Fixed all iTunes12.2 issues. When I go into my App Store updates, I see updates for Garageband and iMovie, but not OS 10.10.4. In addition, whenever I get the update notification for iTunes 12.2 and click ‘Download iTunes,’ it takes me to the App Store update page, but then says ‘Can’t connect to Apple update server’ even though I am downloading the iMovie and Garageband updates. What can I do here to get the App Store working correctly? Yeah same problem with me. Don’t know how to solve this. I am using a brand new MacBook Pro (2 months old) and have found myself in a never ending loop of downloading the update, seeing the restart button, then going back to being prompted to download the update again. Two hours and counting of this now. I think I might be going mad. Had the same problem with MacBook Air (11-inch, Mid 2012), your fix worked perfectly, App Store app is back to normal, thanks a lot! Thanks!! I was extremely p*ssed off, already restarted AppStore and Mac for about 10 times, and my MBP 13″ kept going hot and didn’t do any updates. Tried it via Terminal, no problems at all! Thanks so much for this post! It seems that OS X 10.10.4 was my issue. Thanks for the help! Hey! This solved the problem! Thanks a lot for the solution! Excellent tip! However neither “killall software updated” nor “sudo killall software updated” worked (still using 100%). Rebooted and then ran “softwareupdate -i iTunesXPatch-12.2”. iTunes was installed and then the normal update procedures via App Store worked flawlessly. I’m experiencing the problem you listed exactly. When I tried to update iTunes 12.2 the updates tab in the App store freezes on me. I’m not a computer science guy at all, but I tried to follow your steps in the terminal. I put in the iTunes patch and it says “Finding Available Software” but nothing comes up after that. Am I missing something? Thanks for your help! I did software update -l and it listed the updates, including the iTunes patch. Then I did software update -i iTunesXPatch-12.2 and it was “Finding available software” and then it says “Downloaded iTunes.” But when I open iTunes it definitely isn’t downloaded, and still wants me to update. Manual iTunes update worked perfectly for MBP 13″ Retina, late 2012. By the way, how does one find out the command line for a specific update? I don’t need an update to my software. Apple, when you get the update to work like updates are suppose to work, let me know. I’ll wait. No stink, no stir. Thank you. This fixed my issue. I’ve all the same problems as everybody else. When I tried the terminal method it immediately went to “Finding available software” and it’s been there for over 20 minutes already. Not sure if it’s hung or if it’s actually downloading anything and just taking a while. How long has it stayed at that spot for people who had successfully updated? Finally got it working. I did have to abort the terminal method. I deleted all the stuff in /Library/Updates and then used the terminal method again and it all worked. Thanks (but not to Apple). Didn’t need the iTunes, but the 10.10.4 upgrade from 10.10.3 never appeared in the App Store updates, but amually applying it resolved my issue. Thank you very much! It worked! two MacBooks here with the older one updated no problem from App store. 9 month old macbook air though had the App store searching for update issue. So found this site from search and started OS 10.4 update from the command line code above (It was the big file so did not try all the updates). Got up this morning and it is 15 hours later and it is still loading code into the console. So I’m looking back in the terminal window and it says the update tool was started, then a line about error service connection interrupted. Then a line could not communicate with helper application. And started update without it I believe. I’m taking this is the reason it is so slow. I don’t need the Air specifically and can just let it load slowly? Our should I kill it (How do I do that?). Any thoughts and help would be appreciated. Using the command line to install, I finally solved the problem. I had trouble with Software Update stalling on this week’s iTunes update. Force Quitting Software Update solved the problem (force quitting, not just closing the app normally). After the update I cannot get any program to work properly, Not even able to click on anything due to constant spinning deathball, anyone else having this issue? Update of OS X El Capitan Update-10.11.1 stalled during download and “calculating” message. Now with this command line procedure I could do the update. Hope this update will fix also future update issues ! Is there a simple answer yet out of all this? It is very time-consuming, especially using the Mac for work, to reinstall the whole operating system (and many other rather time-consuming bugs I have experienced since Capitain. I’ve three Mac devices and about to buy another, but it is a bit depressing that core functions can’t just work as they should. I have the same problem. I’m attempting app updates on this just-out-of-the-box “new” MBP mid-2014 running Yosemite 10.10.2. Curiously, Garage Band updated successfully. But Numbers, Pages, Keynote, iPhoto, and iMoving all get stuck spinning after clicking update. Haven’t tried the suggested solutions yet. Being new to Mac, I did not want to update all till I get a chance to look around Yosemite before updating to Captain. Kinda disappointed. I’m used to this kind of sloppiness on Windows – didn’t expect it on Mac. 1) After updating one app, the button would change to “Updated” for all the apps. I had to exit App Store and reenter it to reset the buttons to allow further updates.